50 Shades of Envy Valentines Day Party w/ DJJohnnyUtah. 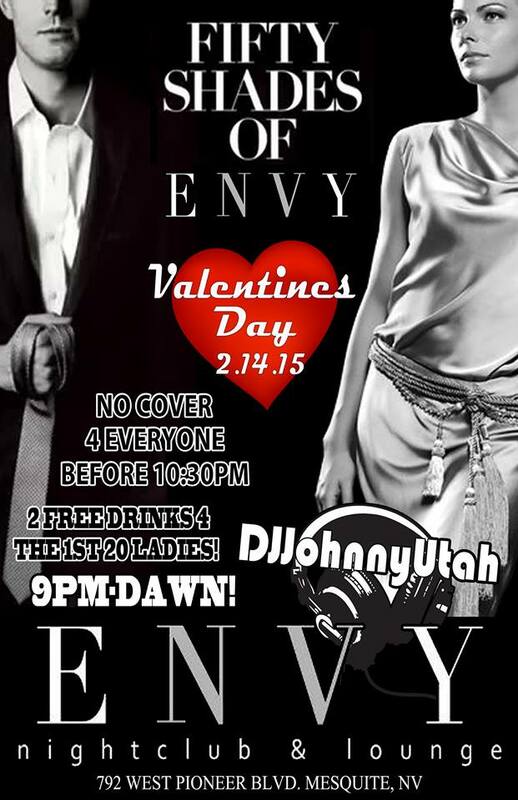 Party til Dawn this Valentines Day at Envy Nightclub and Lounge in Mesquite. No Cover Charge for Everyone before 1030pm. The First 20 Ladies in the Door after 9pm get 2 FREE Drinks! That Night we will be Giving away FREE Movie Tickets to 50 Shades of Grey, FREE Piercings from Rix Tattoo, Piercing, Hair and Nails and Freddy A Martinez, FREE Glow Sticks and Much More! Get there Early for a Better Chance to WIN. Bring a Date or Find one there this Valentines Day. BIRTHDAY VIP Promotions Available. If its your Birthday or a Friends Text Toby at (801) 231-3096. VIP Seating is Available and Bottle Service starts at Only $150 so Impress your Date this Valentines Day.